Carmike Cinemas(CKEC) beat fourth quarter 2009 expectations. Earnings per share of 48cents came in well ahead of the 9cents expected. Revenue surprised to the upside also, coming in at $137.4million versus the expected $126mil. Shares are up 6% after hours to $10.05 - add that to today's performance and the shares are 10% higher than Friday's close. While the full year results showed an impressive improvement from 2008, the 4th quarter truly was a standout. Average admissions per patron grew 7% in the fourth quarter, almost twice the full year's 3% growth in that metric. Carmike shares are up 850% off the lows of last spring, but are still 75% off 5year highs. 2009's performances been a huge slap in the face of those calling for the death of the cinema business. Instead of being decimated in a recessionary environment, heading to the movies turned out to be a low cost entertainment option - maybe a trade-down from other activities. 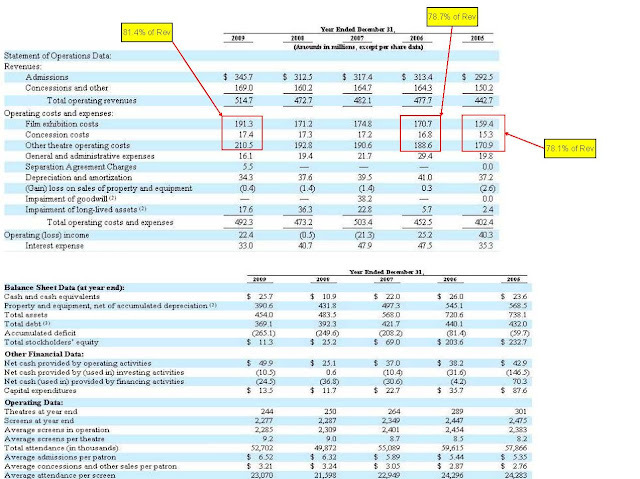 If you pull out one-time and non-cash items, I get to an EBITDA level of 79.5million for the full year 2009 - that's up $2million from the 2005 numbers, despite revenues being 72million higher. Ouch. They are getting the crowds, but it's costing a lot to get them in the door, by way of higher operating costs. The company knew the customers were expecting better experiences in the theaters, so Carmike increased the quality of their service. Also pressuring costs are minimum-wage hikes in multiple localities A bright spot is Concessions, where 2009 revenue was $19million above 2005's level, while costs were only $2million higher. You read that right. At this level, Carmike is trading at a EV/EBITDA ratio of over six. Kudos to their performance, but I will pass on the shares.